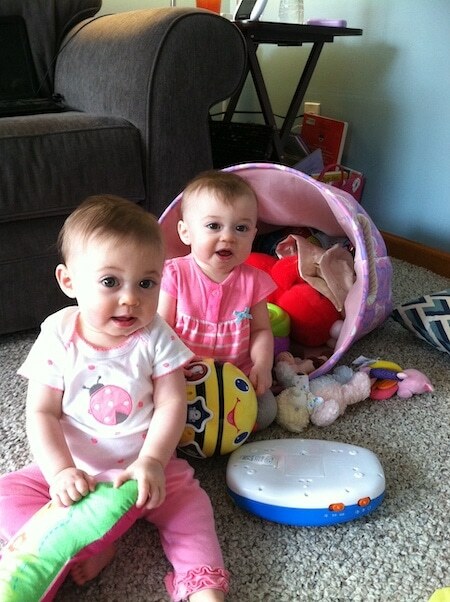 9-to-12-month-old twins are transitioning out of the infant stage and are becoming mobile. 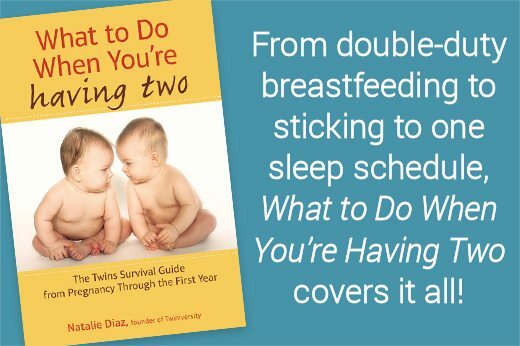 Your twins may be creeping, crawling, cruising, or even beginning to take their first few steps. This new mobility gives your children a new perspective on all that is around them in the world. 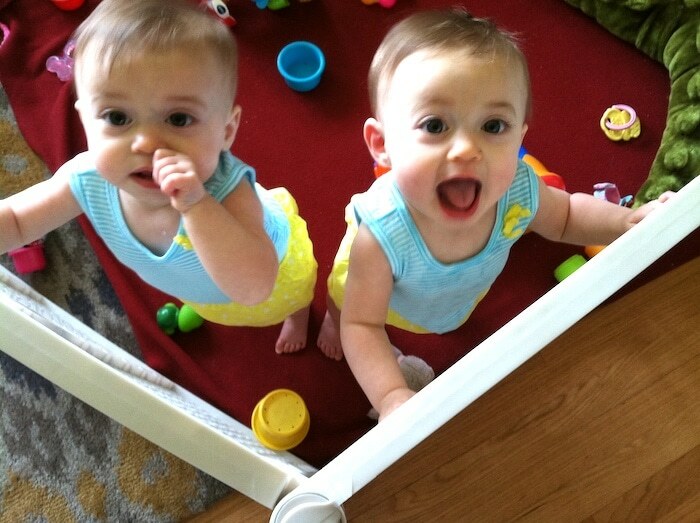 When my twins first started to crawl, I think I was more excited than they were about their ability to move. My identical twin daughters were born at only 3 and a half pounds each and in those first few weeks, I couldn’t imagine them making it to 9 months and being able to move on their own. 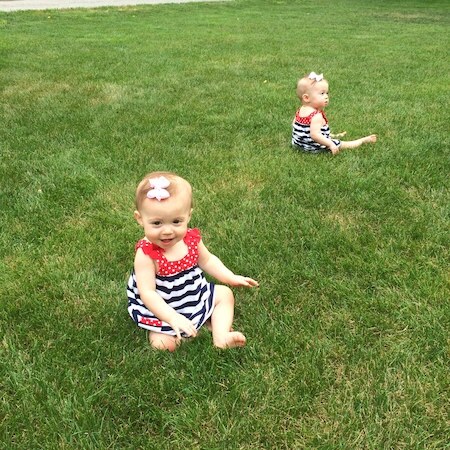 As a mom, you constantly look to see what other children the same age as your own are doing and I found myself wondering why other babies were crawling at 7 months, but mine were not. I had to keep reminding myself that each baby develops at their own pace. I was thrilled when my daughters started crawling at 9 months. 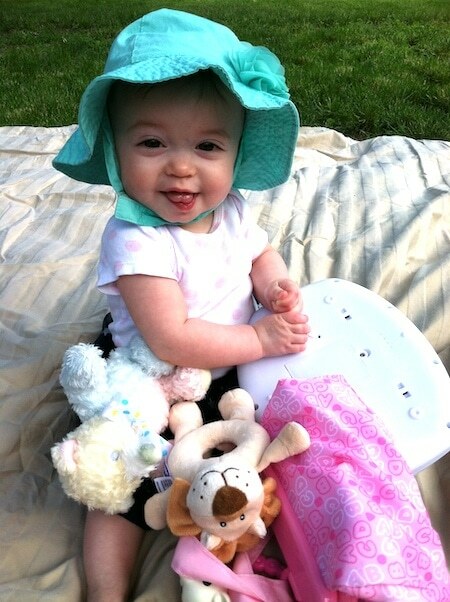 At 9 to 12 months old, my daughters’ personalities shined. 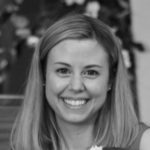 At this age, they created their unique likes and dislikes, everything from food choices to toy preferences. This goes hand-in-hand with this age’s discovery of all things new – new adventures, new developments, new experiences. As parents, we can enhance our children’s discovery with activities designed for their age level. 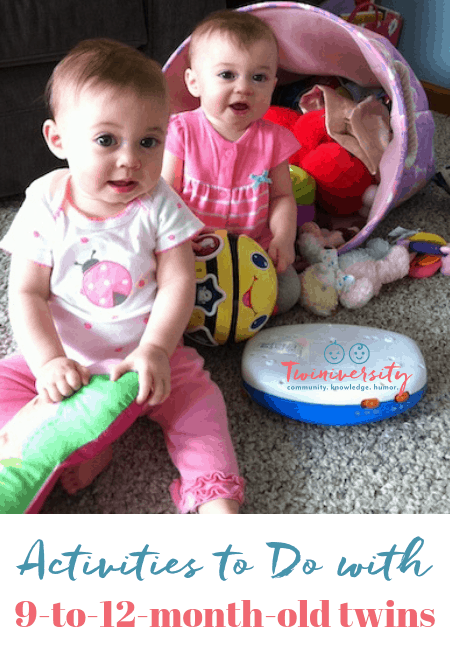 Here are a few activities that you can do with your 9-to-12-month-old twins. Nothing is more fun for babies to play than peek-a-boo! It may seem like an obvious activity to play, but now that your son(s)/daughter(s) are moving, peek-a-boo can be played by hiding behind objects, therefore creating a need to crawl around the barrier to “find” the missing person. This teaches your twins about cause and effect (if I crawl around an object, I will find missing mommy) as well as the skill of taking turns. When the weather is nice enough, gather up a group of toys and set up a big bedsheet on your lawn. Let your babies play while getting fresh air at the same time. Bring some finger foods out with you and give your babies the opportunity to eat without being confined to a high chair. Bang, clink, and clang your way to fun! Let your multiples take turns playing a variety of instruments. This helps your 9 to 12-month-old babies hear different sounds that a single instrument can make. Help your little ones notice what happens when you tap an instrument lightly versus when you bang it with force. If you don’t have any play instruments, use pots, pans, and big spoons. 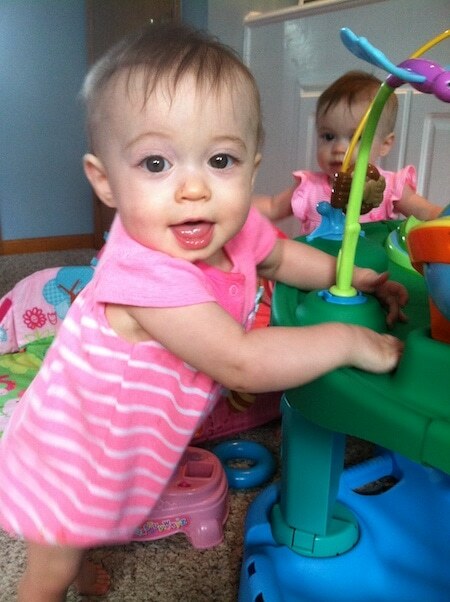 Use your living room to create an obstacle course fit for a 9-to-12-month-old. Use your furniture, boxes, blankets, and toys to set up places for your babies to crawl through or move around. Make it extra fun by joining in on the excitement and showing your multiples how to navigate through the course. Get items in a variety of sizes, or stacking cups. Show your little ones how to stack the blocks from biggest to smallest and then knock them down. The real excitement comes when the twins knock down the towers before they are completely built. The adult needs to get crafty in guarding the tower to get it built before it is knocked down. Soon, the twins will be able to help build the tower. Rolling a ball has never been more fun than with two 9-to-12-month-olds. Sit in front of your children and say, “Ready, Set, Go,” and roll a ball so that the babies will have to crawl after it. Show your multiples how to roll the ball back. This helps promote hand-eye coordination. 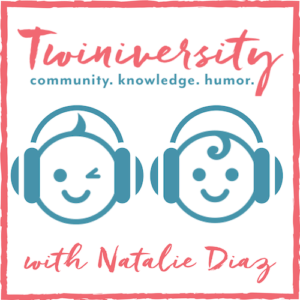 Your babies are constantly building their communication skills and taking in all the words (as well as the non-verbal communications) you are using. Help your multiples develop these skills by dramatically using new words – this is a “block” – pronouncing each syllable. Read a book, then read it again pointing out objects in the book, describing what the characters are doing in your own words. Get down to their eye level so they can see your mouth and start making connections between the sounds and your mouth movements to develop speech. 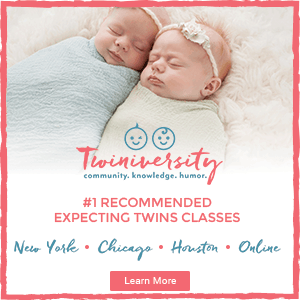 Whatever you do with your9-to-12-month-old twins, try to have fun and cherish the little moments with your twinnies, as this stage goes by so quickly.